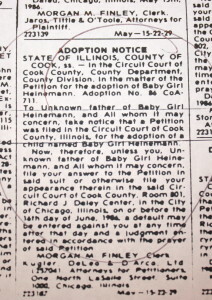 Posting in CDLB notifying Unknown Father that his baby girl is up for adoption. How many men regularly read CDLB and how many are named Unknown Father? For the record, I knew the mother here. She was at the “home” with me. I am pretty certain she knew who the father was. As such, this posting is also a bit curious to me. 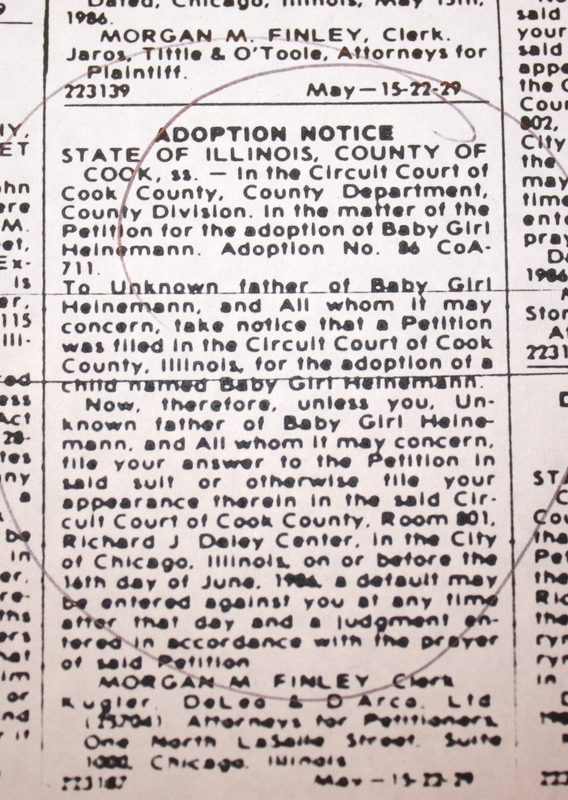 Notice to Unknown Father. 1986. Click for larger version. 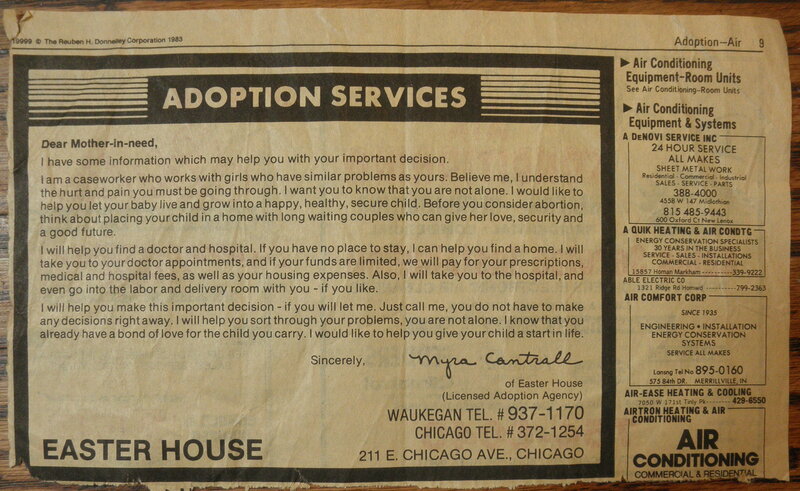 The following image was sent to me by a mother that surrendered her child to Easter House in 1982. This is a 1983 advert. Sit with that a moment. She saved the yellow pages ad. I have my own ideas on this (and seemingly benign objects I saved) but I will spare you those thoughts for now. Do feel free to share your own. Really. Read it. Thank you to the mother that provided it to me. Like much of the family preservation and adoption reform community, I am pained by the transfer of Veronica Brown to the adoptive parents. I am in tune enough with my own feelings to realize that some part of my agony over this little girl is the triggering effect. 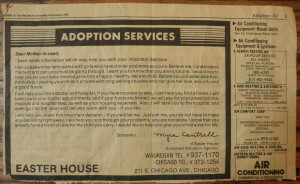 The transfer of her to the adoptive parents caused me to feel my own pain, my own trauma, the loss of my daughter again. I feel for Dusten Brown in ways I cannot even articulate. I feel for Veronica even more. When I am not emotional, or trying to avoid the pain I feel, I am analytical and yet I still experience overwhelming emotion. As a mother raising two boys, I fear for my sons. I fear for natural mothers and fathers of the future. I fear what this portends for our country. I have much to say yet I am pained. I leave you to think about this. Really think about it. If you are aware of what has happened with Veronica Brown, think about what it suggests for the future. Just think.